Wix's Wufoo integration allows you to easily embed one of our forms into your site in a few short minutes. You can also use Wufoo's professionally designed form templates with your favorite website creator. If you need to add a contact form or online survey to your Wix powered website, you can use their Wufoo integration to easily embed our forms right into your web page. Now you can interact with your users and visitors without having to write a single line of code. You never have to worry about designing your own database backend or writing another email script, Wufoo will do everything automatically for you and get you collecting leads and data from your users quickly and professionally straight from your own web site. Wix.com is the leading publishing platform for making professional looking and dynamic websites and widgets. Wix is ideal for small businesses who want a great website. The basic offering is free and there is no coding involved, no files to download and no activation fee. 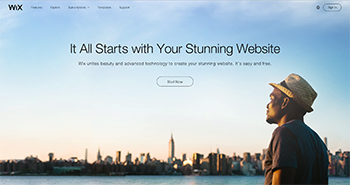 With a user-friendly graphic interface, Wix's free website maker is a pleasure to use.